Pound sterling, strictly speaking refers to basic currency unit of sterling, now the pound , which is the currency of the United Kingdom (UK). The sign for the pound is £ (or rarely just "L"). Both symbols derive from libra , the Latin word for " pound ". The standard ISO 4217 currency code is GBP = Great Britain Pound. The pound sterling is one of the worlds most widely traded currencies along with the United States dollar, the Japanese yen and the euro. In the UK, in order to distinguish the unit of currency from the unit of weight, and perhaps from other units of currency that have the same name, a pound is sometimes referred to more formally as a pound sterling or sometimes simply sterling . The slang term quid is also substituted in informal conversation for "pound(s) sterling". The sterling was originally a name for a silver penny of 1/240 pound. In modern times the pound has replaced the penny as the basic unit of currency as inflation has steadily eroded the value of the currency. Originally a silver penny had the purchasing power of slightly less than a modern pound. As a unit of currency, the term pound originates from the value of a troy pound of high purity silver known as sterling silver . An Act in 1266 set the weight of the silver penny, so one pound of sterling silver would yield 240 silver pennies. However, although the Pound was subsequently used in accounting (to complement and eventually replace the Mark, valued at 160 silver pennies), no pound coin was issued until 1489. The penny was originally one '"pennyweight"' of silver. A pennyweight is a unit of mass which is the same as 1.555 grams, or 1⁄240 of a troy pound. So, a penny was literally, as well as monetarily, 1⁄240 of a troy pound of sterling silver. Sterling (with a basic currency unit of the Tealby penny , rather than the pound) was introduced as the English currency by King Henry II in 1158 , though the name sterling wasn't acquired until later. Pound sterling was established in 1560 – 61 by Elizabeth I and her advisors, foremost among them Sir Thomas Gresham , brought order to the financial chaos of Tudor England that had been occasioned by the "Great Debasement" of the coinage, which brought on a debilitating inflation during the years 1543 – 51 . By 1551, according to Fernand Braudel (Braudel 1984, pp 356ff), the silver content of a penny had dropped to one part in three. The coinage had become mere fiduciary currency (as modern coins are), and the exchange rate in Antwerp where English cloth was marketed to Europe, had deteriorated. All the coin in circulation was called in for reminting at the higher standard, and paid for at discounted rates. Pound sterling maintained its intrinsic value — "a fetish in public opinion" Braudel called it — uniquely among European currencies, even after the United Kingdom officially adopted the gold standard, until after World War I, weathering financial crises in 1621 , in 1694 – 96 , when John Locke pamphleteered for the pound sterling as "an invariable fundamental unit" and again in 1774 and 1797 . Not even the violent disorders of the Civil War devalued the pound sterling in European money markets. Braudel attributes to the fixed currency, which was never devalued over the centuries, England's easy credit, security of contracts and rise to financial superiority during the 18th century . The pound sterling has been the money of account of the Bank of England from its inception in 1694 . The Guinea was a coin until 1797, it was the first British machine-struck gold coin, and was originally worth one pound. However, the name continued in use to reflect a sum of 21/- (one pound and a shilling) well into the 20th century. In fact the term guinea survives in some circles, notably horse racing, to mean an amount of one pound and five pence in decimalised currency. By 1945, the money in circulation was as follows. The most commonly used nicknames are given in brackets. 'Copper' and 'silver' coins were, by this time, made from alloys and were named for their colour, rather than the actual metal used. There were 20 shillings to the pound and 12 pence to the shilling. Farthings were not produced after 1956 and were withdrawn in 1960, because of inflation. In preparation for decimalisation, the ha'penny was withdrawn in 1969, with the half-crown being withdrawn the year after. From 1968, 5p and 10p coins, identical in size, weight and value to the shilling and florin respectively, were introduced. The symbol, £, for the pound is derived from the first letter of the Latin word for pound, the librum. The old abbreviation for the penny, d, was derived from the Roman denarius. The old abbreviation for the shilling, s, was derived from the Roman solidus. After Decimal Day, the value of one penny was therefore different from its pre-decimalisation value. For the first few years after 1971, the new type of penny was commonly referred to as a "new penny". Coins for denominations of ½p, 1p, 2p, 5p, 10p and 50p all bore the name NEW PENCE until 1982, when the inscription changed to ONE PENNY, TWO PENCE, FIVE PENCE and so on. One pound is divided into 100 pence, the singular of which is "penny". 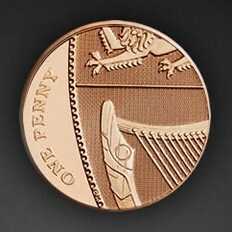 The symbol for the penny is "p"; hence coins are often pronounced "pee" rather than "penny" or "pence". Notes come in the following denominations: £5 note . £10 note . £20 note . £50 note. Scotland even has a £100 note. There are no Welsh banknotes in circulation. Some pre-decimalisation coins or denominations became commonly known by slang terms, perhaps the most well known being bob for a shilling, and quid for a pound. A farthing was a mag, a silver threepence was a joey and the later aluminium-bronze threepence was called a threepenny bit (pronounced threp'ny bit), a sixpence was a tanner , the two-shilling coin or florin was a two-bob bit, and the two shillings and sixpence coin or half-crown was a half dollar. Quid remains as popular slang for one or more pounds to this day in Britain in the form "a quid" and then "two quid" etc. The slang name of some pre-decimal coins are still in but with changed usage. There are Maundy coins in denominations of one, two, three and four pence. They bear dates from 1822 to the present and are minted in very small quantities. Though they are legal tender in the UK, they are never encountered in circulation. The pre-decimal Maundy pieces have the same legal tender status and value as post-decimal ones, and were effectively increased in face value by 140% upon decimalization. Their numismatic value is, of course, much greater. You can read more about Maundy money here. As a member of the European Union, the United Kingdom has the option of adopting the euro as its currency. However, the subject remains politically controversial, not least since the United Kingdom was forced to withdraw from its precursor, the European Exchange Rate Mechanism (see above). The pound did not join the Second European Exchange Rate Mechanism (ERM II) after the euro was created. Unique to Denmark and the UK is an opt-out from entry to the euro. Technically, every other EU nation must eventually sign up; however, this can be delayed indefinitely (as in the case of Sweden) by refusing to join ERM II. Strangely, you can use the euro in some of the larger shops, especially in London, for example Marks and Spencers have dual pricing, but you get your change in Sterling. The Britannia image was on British coins for centuries. Britannia is the Boadicea-like female warrior that is a traditional emblem for Britain and the British Empire, and is symbolic of British democracy, patriotism and liberty. Her image first appeared on the copper farthing back in 1672. A penny pictured the portcullis of Westminster Palace. 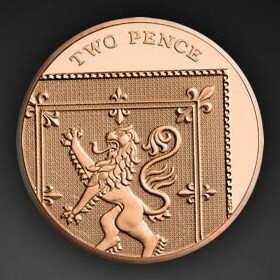 The two pence coin pictured the Prince of Wales feathers. The five pence coin pictured the thistle (a Scottish symbol). 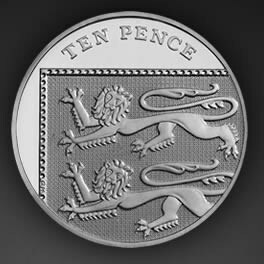 The ten pence coin pictured a lion, which is wearing the crown of the Monarch. 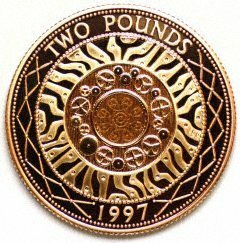 The twenty pence coin pictured the Tudor Rose. The rose is the national flower of England. 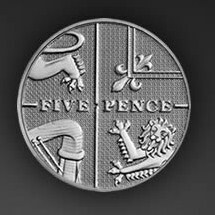 The fifty pence coin could have many different designs, as quite often commemorative coins were produced. 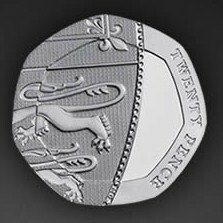 The current coin in circulation shows part of the royal shield. Pound coins showed symbols depicting things like a leek, of all things, for Wales, a thistle for Scotland, an oak tree for England. 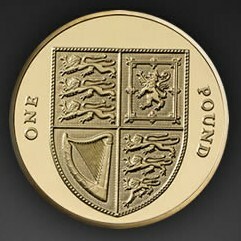 Nowadays British coins, apart from the two pound coin, picture parts of the Royal Coat of Arms, if you put them all together it shows the complete picture as represented on the one pound coin. Bank of England - The powers that be. The Bank of England sets the UK's interest rates to keep inflation low, issues banknotes, and works to maintain a stable financial system. The treasury - The United Kingdom's economics and finance ministry. 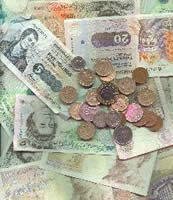 Money Matters - You can discuss finance here.